There has been a marked drop in US air strikes on IS positions in Sirte, which may reflect a reduction in the number viable targets. Yesterday there were no US attacks at all, with only one, on what was described as a terrorist supply point, during Saturday, after four air attacks on Friday. 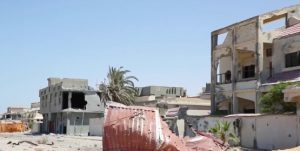 The U.S. Africa Command has reported that as of yesterday it had launched 175 airstrikes in and around Sirte. There was limited fighting today as Bunyan Marsous forces appeared to be preparing for another large assault. Four fighters have died in the last 24 hours and at least four more were injured. The BM operations room said that two terrorists also died. The official death toll among the predominantly Misratan militias is now approaching 600 with more than 2,000 men injured. Some observers believe that the cost in lives and wounded may in fact be higher. Despite being surrounded in the town’s Third District in an area of around a square kilometre, and being blockaded by sea, the terrorists still do not seem short of ammunition and explosives. Two car bombs were destroyed on Thursday while they were still leaving IS lines. Though not confirmed by the BM operations room, there have been media reports that women have been seen fighting with the terrorists. Italian troops are now guarding a 12-bed Italian army field hospital at Misrata airport. The paratroopers arrived by sea in Misrata in a low key operation. They were met by members of a small contingent of Italian soldiers who came by air two weeks ago. The field hospital is to be expanded shortly to accommodate 50 injured. According to a spokesman in Rome, a C-130 Italian air force transport has been stationed at Misrata airport to evacuate seriously wounded cases.